Home » FREEBIES » FREE ZooDino’s Magazine + Activity Sheets! FREE ZooDino’s Magazine + Activity Sheets! Check this out ! Run [ HERE ] and grab yourself ( or someone you know ) a FREE ZooDino’s Magazine + Activity Sheets. Just fill out your name and address and in a few weeks they will have it at your door. [ CLICK HERE ] to get yours. I have gotten it for my 2 boys and they are in love with it. 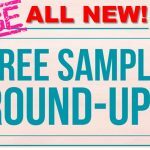 Freebie ROUND-UP! 100's of FREEBIES - Updated 3/20 !